Picking Wall Colors - Kellbot! | Kellbot! Now that the floors are in (photos forthcoming after the dust is gone) we can start picking out paint. Picking paint colors is hard. For the time being we’re just focusing on the main floor, which is an open floor plan with a kitchen in the middle and room for seating at either end. On one end, nearest to the kitchen, we want to create a nice sitting area to chat / read, with built in bookcases. This area opens up to the back patio as well as the kitchen (which has decidedly contemporary cabinets), so we kept it pretty light and airy. There’s also a fireplace surrounded by blue-green stone on one wall, which dramatically influenced what colors we could use. I got a few different swatch strips from the paint store and taped them all up next to the fireplace to see which hue matched the stone the best. The chairs we chose in approximately the colors we chose. 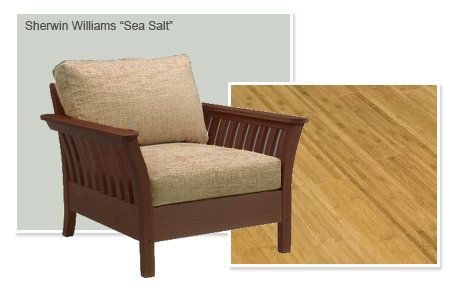 Armed with our paint swatch and a sample of our flooring we headed to the furniture store, and spent maybe an hour comparing woods, stains, and upholstery until we got something that looked good together. At the other end of the house is what we’ve been calling the “media room,” which is basically a shrine to our video game consoles. After keeping things pretty tame in the living room, we went a little nuts with color and opted for decidedly more modern furniture. 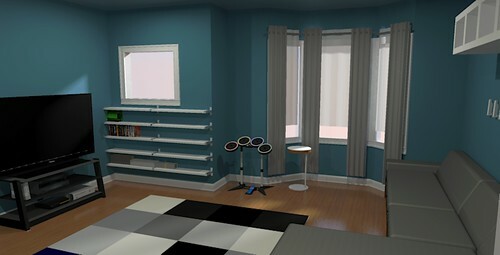 To choose the blue, I went a little overboard and mocked up a ton of different color options in Google Sketchup. 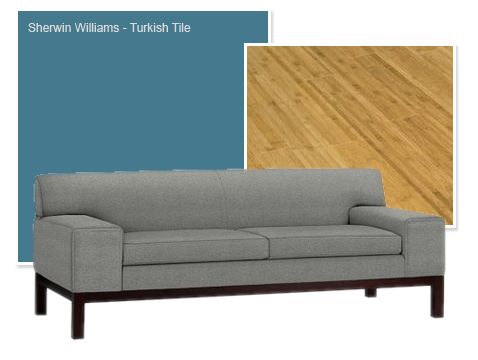 I even created a 3D model of the sectional we picked out. Sherwin Williams conveniently provides the approximate RGB values for their paints, and you can see some of the earlier color options on Flickr. After a ton of deliberation we had our color, and a vague idea of what it might look like. I got a sample quart of paint and painted swatches on each wall in the room, to make sure it was going to look right. After picking out color for just two rooms I’m pretty sick of looking at paint swatches, so I doubt I’ll go quite as nuts with mockups and options for the bedrooms. We’re headed to Disney World next week, and I’m definitely looking forward to a week away from looking at home decor!